Granite is beautiful for countertops in the kitchen, bathroom, and anywhere else you have countertops in your home. It is durable, can handle high and low temperatures, wears well, and is aesthetically beautiful. It adds so much character to a home. When it comes to granite kitchen countertops, there are a variety of edges to choose from depending on what look a homeowner is going for. Included in the variety are free or basic edges, laminated edges, upgraded edges, and fully-custom edges. It’s true though that the simpler of an edge you choose for your granite, the less expensive it will be. An automatic machine-designed edge costs much less than one that is done by a professional craftsman that uses his hands and special tools. The more custom the project, the more expensive it will be. Some people get confused by what a laminated edge is. 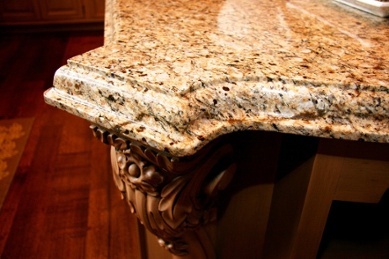 Laminated edges for granite countertops are different than laminate stone countertops. In fact, they have nothing to do with each other. A laminated countertop is called lamination which is the process of gluing a piece of stone underneath another piece of stone to give it the look of being thicker. Laminated edging is the process of cementing a second piece or layer of granite to the very edge of the countertop as opposed to the entire countertop. Creating a laminated edge then gives way to a variety of looks in edges and details to make it look like a truly custom countertop. Many describe it as a very modern yet dramatic look that adds beautiful depth to a kitchen or bathroom. Laminated edges are a wonderful addition to your granite countertops but it can become more of a problem if the homeowner doesn’t hire someone who can do it correctly. It’s a very complicated and complex process and can end up looking awful if not done by someone very skilled with laminate granite countertop edges. Often times, the seam can come apart because of the correct glue not being used. It’s important to see a portfolio of work from the company or craftsman you hire that will be installing your granite countertops and laminating your edges. When it comes to glue, make sure that strong epoxy glue is used and not a cheap form of polyester glue. If your countertop is made for the outside by a grilling area, the sun can cause the glue to deteriorate much more quickly. 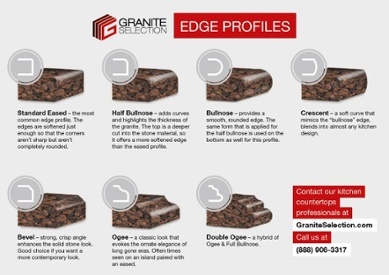 Make sure you get all your questions answered in detail before choosing an edge for your granite countertops. It’s an expensive investment that will be beautiful for years to come so don’t make a rash decision!